North Korean leader Kim Jong-un would likely reaffirm his commitment to moving forward denuclearization talks with Washington but would also call on it to take corresponding measures in his New Year’s speech, experts say. The message of the upcoming New Year’s speech is garnering attention because North Korea has neither given any specific response to recent conciliatory gestures by the US nor engaged it in working-level and senior-level talks to hammer out the details of how denuclearization should proceed. 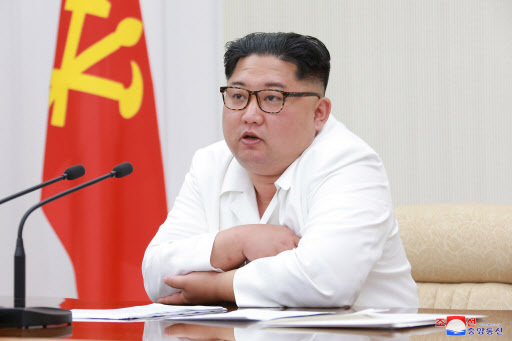 Kim is likely to signal his complaints about the US sticking to sanctions against North Korea and urge it to take corresponding measures, according to Cho Han-bum, senior researcher at the Korea Institute for National Unification. The reclusive country has used the annual speech to assess its achievements in the previous year and outline key policy goals for the coming year, with the world watching closely to find out the North’s positions on major issues, such as nuclear and missile development and its relations with the US and South Korea. On the first day of 2018, Kim expressed his willingness to improve inter-Korean relations and send athletes to participate in the PyeongChang Winter Olympics, which led to three inter-Korean summits and the first-ever US-North Korea summit. But nuclear talks between the US and North Korea have been in a stalemate since their Singapore summit. North Korea appears to demand sanctions relief from the US more than anything else, while the US asks the North to verifiably and irreversibly dismantle its nuclear weapons program first. In an apparent attempt to lead the North to the negotiating table, US President Donald Trump once again said he looked forward to a second summit with Kim in a Christmas Eve tweet. US Vice President Mike Pence reportedly canceled a planned speech on human rights in North Korea so as not to anger the North and further derail nuclear talks. In addition, the US State Department said it would review the possibility of easing travel restrictions on North Korea to facilitate the provision of humanitarian aid to the impoverished country. “In terms of external relations, North Korea could stress its willingness to improve inter-Korean relations dramatically and send a positive message to the US to continue momentum for dialogue,” said Shin Beom-chul, a research fellow at the Asan Institute for Policy Studies. The Choson Sinbo, a pro-Pyongyang newspaper in Japan, said Wednesday that the new phase of history that began in June with the North Korea-US summit would continue to develop despite ups and downs. Last week, it also reported on Kim’s “unchanged” commitment to complete denuclearization. The North Korean New Year’s speech, however, usually focuses on domestic issues, Shin said. “Kim is likely to emphasize North Korea’s economic development this time,” he said. In April, North Korea shifted its policy focus toward economic development, breaking away from its earlier Byungjin line -- that is, a policy emphasizing the parallel development of nuclear weapons and the economy. Some analysts view the change as an attempt to lay the groundwork for negotiating away its nuclear arsenal. “The North could show a possibility of reducing the size of its military to redistribute the country’s human resources (for economic development),” said Shin.